T.2.G.1 | T.2.G.1 (En Español) Apply congruence and similarity correspondences and properties of figures to find missing parts of geometric figures and provide logical justification. T.2.G.2 | T.2.G.2 (En Español) Investigate the measures of segments to determine the existence of triangles. T.2.G.3 | T.2.G.3 (En Español) Identify and use the special segments of triangles (altitude, median, angle bisector, perpendicular bisector, and midsegment) to solve problems. T.2.G.4 | T.2.G.4 (En Español) Apply the Pythagorean Theorem and its converse in solving practical problems. T.2.G.5 | T.2.G.5 (En Español) Use the special right triangle relationships (30˚-60˚-90˚ and 45˚-45˚-90˚) to solve problems. 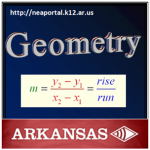 T.2.G.6 | T.2.G.6 (En Español) Use trigonometric ratios (sine, cosine, tangent) to determine lengths of sides and measures of angles in right triangles including angles of elevation and angles of depression.